There has been a lot of controversy over Apple’s new Lightning connector introduced with the iPhone 5 and refreshed iPod lineups. Perhaps the biggest source of frustration for users and accessory manufacturers alike is the inability, so far, to produce official third-party products using the new standard. Apple has yet to update accessory makers with changes to its ‘Made For iPad/iPhone/iPod (MFi)’ policies. This will apparently require approval of facilities manufacturing Lightning products, but according to reports, it will not come until at least next month. For accessory makers wishing to produce unofficial Lightning products, that process has proven difficult thanks to chips Apple has built into the connector thought to include security features. Despite reports that the security features have already been reverse engineered, and one or two third-party products on the market using the original Lightning cables from Apple’s suppliers, we have yet to experience a flood of Lightning products available to consumers. 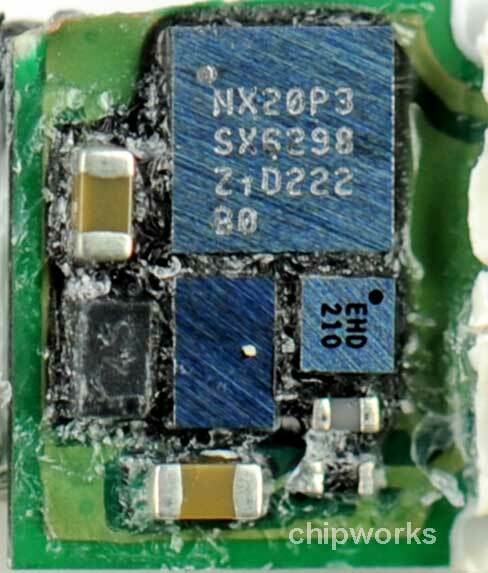 We also did not know exactly what tech Apple is including in these chips, something that we get a better look at today courtesy of a detailed teardown from Chipworks. Another possibility is that the chip is being used to better conserve electricity. For example, the cable could stop drawing electricity once the connected iOS device is fully charged to provide the obvious benefit of saving power. According to research from Opower, the iPhone 5 costs a mere 41 cents annually to charge once per day. However, the focus might simply be a greener, more energy efficient product. The security does not come close to the herculean approaches that are used in (for example) today’s printer cartridges, but resembles the level of effort that cartridge manufacturers used to implement in the olden days. This is likely a calculated decision by Apple to keep costs to a minimum knowing that their core customer base prefers to shop in Apple stores or for brand name peripherals. In these places, piracy is not a concern. In other words, at this time the security is “just enough.” With future generations of Apple and non-Apple products, we may begin to see even stronger security and control if the market forces merit it.